Preheat the oven to 160°C. Place the bacon on a baking tray lined with parchment paper. Bake in the oven for approx. 20 min., or until crispy. In the meantime, whisk milk and egg together in a bowl. Sift flour into the bowl. Next, peel and grate the potatoes into the flour-mixture. Season with salt. Mix well until a batter forms. Melt the butter in a pan over medium heat. Add spoonfuls of potato pancake batter into pan, making sure not to over-crowd the pan. Fry pancakes for approx. 4 min on either side, until golden and the potato is cooked. Finely slice parsley for serving. 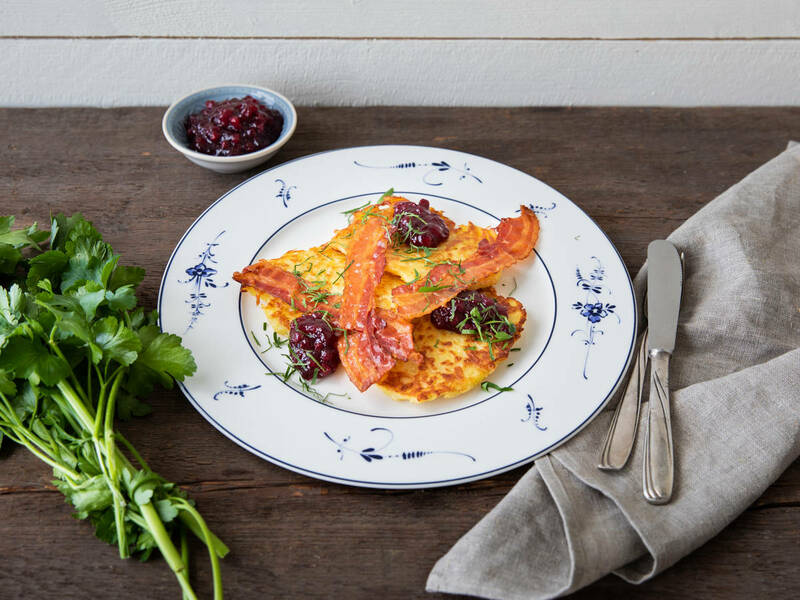 Top potato pancakes with bacon, lingonberry jam and parsley. Enjoy!